Halloween is over but pumpkin is very much in season. 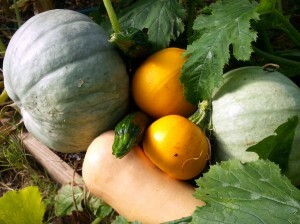 Pumpkins are colourful vegetables in the squash family and they come in all shapes and sizes. They’re versatile and will last for months in a cool, dry environment. I recently heard however, that 15 MILLION pumpkins are wasted in the UK every year. If you add that figure to those wasted in Ireland, everywhere that decorates their Halloween homes and gardens, that’s a colossal amount of food waste, never mind the resources that go into growing pumpkins. Can we do something about it? Pumpkins are inexpensive and make tasty, sweet or savoury dishes yet we undervalue them. One average size pumpkin can provide a snack, soup and dessert and they are far from bland once they’ve been roasted in the oven with oil and seasoning. 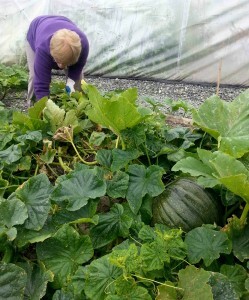 We throw out 15 million pumpkins every year in the UK. Once the pumpkin is carved, there’s not much we can do but before we make it into a creepy devil or spooky cat, we can save all the flesh we scoop out and cook it. Remove the ‘lid’ at the stalk end by cutting a disk shape around the top with a sharp knife. Remove as much of the flesh as you can from the inside, leaving enough so you’re able to carve it without damage. Separate the seeds and leave to one side. If possible, chop the flesh into large bite sized chunks and place on a baking tray lined with baking paper, if not, spread the pumpkin out on a baking tray, toss in olive oil and bake in a hot oven until roasted. Pumpkins are much easier to deal with if not trying to carve them into Halloween faces and roasted pumpkin chunks can also be served hot as a side vegetable. Remove the cooked flesh from the oven and allow to cool. It can now be used in soups, puree and even a tasty pie. If you don’t have time to bake or make right now, bag up the roasted flesh when it’s cool and freeze. I was in my thirties before I tried making any kind of soup and it’s regularly on our lunch menu now I’ve discovered how easy soup is to make. When you grow your own vegetables, soup is a free meal and becomes a great way of feeding a crowd. Making soup is also a terrific way of using up ‘gluts’ of veg and it can be frozen too. Apart from the ingredients, a source of heat and a blender are the main pieces of kitchen gadgetry needed. Once you have those, you’ll be flying. Basically just chop up some vegetables, add them to about a litre and a half of hot water, add a stock cube, some seasoning, heat until the veg have softened, then blitz in the blender. Job done. I’ve a few pumpkin soup recipes in the archives if you’d like to try them, as well as a pumpkin rice recipe. We used a soup recipe from The Happy Pear recently at Gleann na Bearu community garden. It has a heart warming gingery tang and it just feels like it must be doing some good. We also made this no-bake vegan Pumpkin Pie I’d urge you to try for special occasions, assuming you don’t have a nut allergy. If you’ve grown the pumpkin in your garden and you know the variety, you can save the seeds for replanting in the springtime as long as they weren’t from an F1 cultivar (they’re likely to revert back to their parentage if they were F1’s). 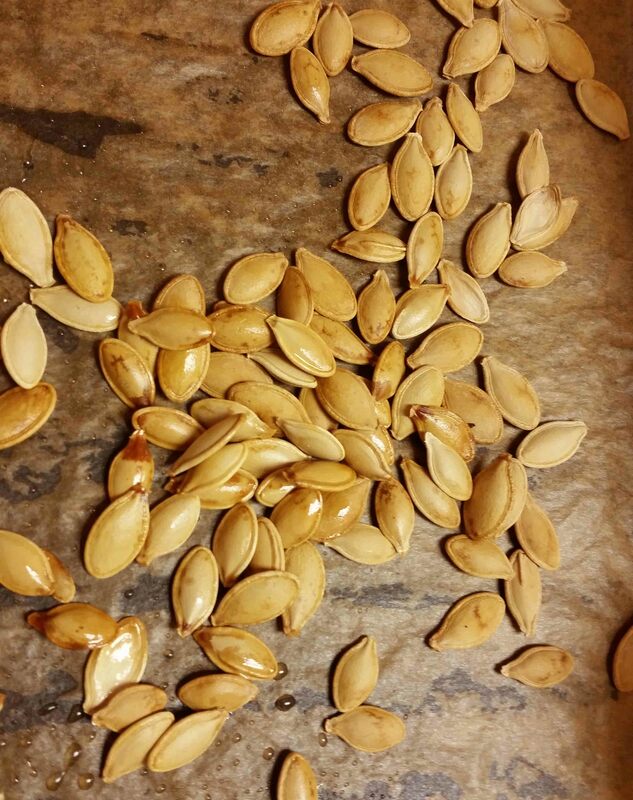 Likewise, if you bought your pumpkin from a farmers market, ask the stall holder what variety they’re selling and you might be able to save those seeds. 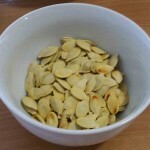 Supermarket pumpkin seeds may or may not germinate, but could be fun to try. To save the seeds, scoop out the soft, seedy, fibrous flesh inside the pumpkin with a metal spoon and place into a colander. Leave to dry fully on parchment paper on a windowsill then pop into brown envelopes, label and store in an airtight tin until you’re ready to sow them. Always sow more than you need for when some aren’t viable. To test the viability of seeds or learn how long you can expect them to last, take a look at this archived post. 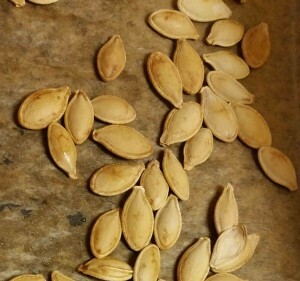 If you purchased your pumpkin from a supermarket, it’s unlikely you’ll know its provenance so why not try cooking the seeds instead of saving them. It’s very easy and they’re tasty too. Clean the seeds as above then add them to a saucepan with the salt and water, bring to the boil then simmer for ten minutes or so to allow the seeds to soften. Take off the heat, drain, pat the seeds dry with a clean tea towel then toss in the olive oil before placing on a baking tray lined with baking paper. Roast in the oven for around ten to twenty minutes, until the seeds brown and are crispy. In the U.S. pumpkin decorating is massive, check out Pinterest for thousands of ideas. 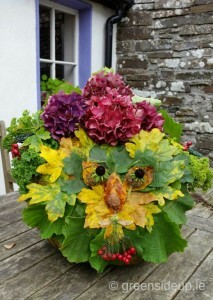 A couple of years ago I entered a bloggers pumpkin decorating competition with a natural, autumnal themed entry. My ‘Green Man’ eventually shared the table with all the chutney a group of community gardeners made to sell at Savour Kilkenny Food Festival. 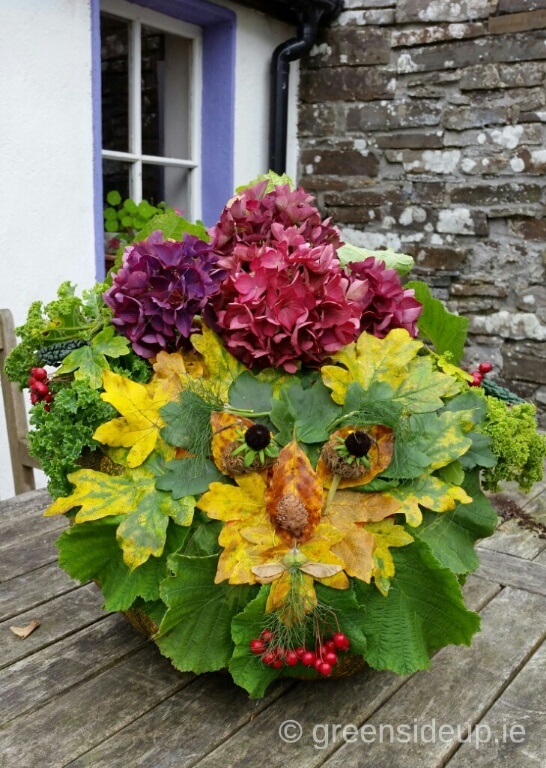 I made the creation pictured by collecting seasonal leaves, flowers and cones and sticking them to the pumpkin skin using a glue gun. Drawing or dressmaking pins would work well too if you’re try to avoid the chemical addition. Not content with growing the vegetables, a couple of weeks ago I rashly gamely offered to demonstrate a few ways of cooking pumpkin flesh at Callan community garden as there’s little point in growing food if we don’t know how to prepare and eat it. It’s the first year we’ve grown a pumpkin patch there and as the fruit have swollen nicely, it seemed a good idea to demonstrate that there’s more to pumpkins than Halloween window decorations. I’m sure many of us are, or have been guilty of discarding the flesh we scoop out and it seems such a waste of good food. In the shops and farmers markets, pumpkins are coming into season and are a vegetable/fruit that will store for months in a cool, dry environment, making them a fantastic winter staple. Not only do pumpkins make great decorations, they are extremely good for us, containing over 200% of our recommended daily allowance of vitamin A, the vitamin that’s good for our eye sight, they’re rich in fibre, contain very few calories and are great for helping to lower cholesterol among other things. 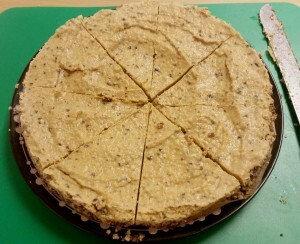 I’m a family cook who likes a recipe in front of me (even though I stray from it quite regularly) which therefore resulted in a very informal cookery session at the family resource centre where everyone helped with the prepping and washing up, before gathering to share the food presented. 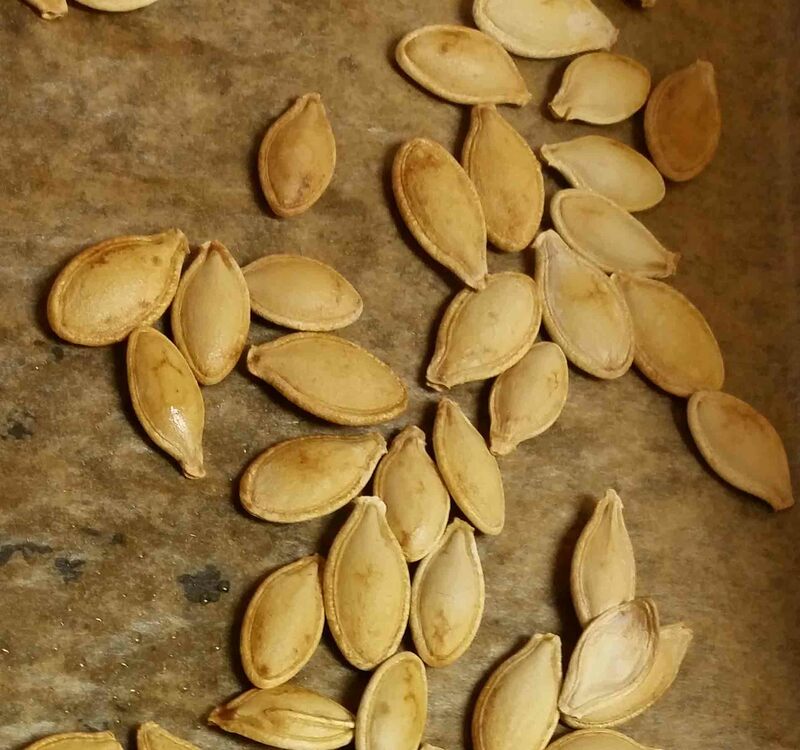 I chose two safe, tried and tasted savoury pumpkin recipes using the flesh from one medium-sized pumpkin, as well as a roasted seed recipe that you can find below. I also demonstrated how to make courgette cake, a recipe I’ve talked about on several occasions but gardeners had yet to try. The courgette cake recipe can be found here and the basic soup and delicately flavoured pumpkin rice recipes here. I’m afraid there’s no photos as I was too busy cooking. I would have loved to have baked a pumpkin dessert for the group but simply didn’t have time to find a recipe that uses fresh pumpkin flesh – no matter where I looked, they all used tinned pumpkin purée. However, I’ve since been given this recipe that shares how to make our own purée by Kristen who writes That Blooming Garden Blog, so they’ll be no stopping us. 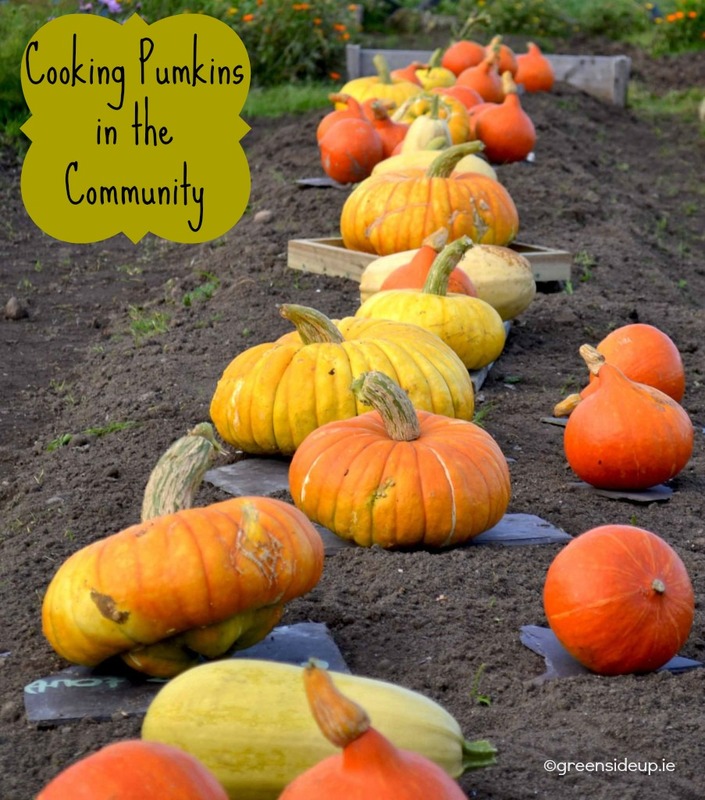 If you’d like to try cooking pumpkins this year, as well as the recipes linked above that I cooked for the group, I’ve added a few variations of soup at the bottom of the post from some fellow garden bloggers. 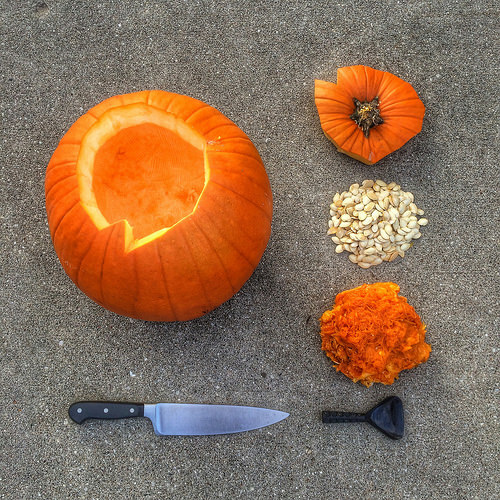 Remove the ‘lid’ of the pumpkin at the stalk end by cutting a disk shape around the top with a sharp knife. Scoop out the soft, seedy, fibrous flesh inside with a metal spoon and place into a colander, leaving the tougher flesh that’s around the inside of the pumpkin to tackle later for another recipe. Add the seeds, water and salt to a saucepan, bring to the boil then simmer for ten minutes or so to allow the seeds to soften. Take off the heat, drain, pat the seeds dry with a clean tea towel then toss in the olive oil before placing on a baking tray lined with baking paper. Roast in the oven for around ten to twenty minutes, until the seeds brown. Soup is such a versatile dish, quick to make and winter warming too. 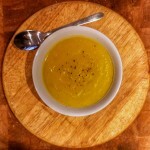 Here are some links to three variations of pumpkin soup you might like to try. The first is from Emma from De Tout Coeur Limousin in France where she adds sage, garlic and chilli to her pumpkin recipe . Secondly, from Kristin in British Columbia, a step by step guide to pumpkin soup with a nutmeg flavouring, very handy if you’re new to soup making. Lastly (and these are in no particular order) Heather from the New House New Home New Life blog makes a curried soup and although has used purée as a base, the flavouring could easily be switched to a fresh pumpkin recipe. 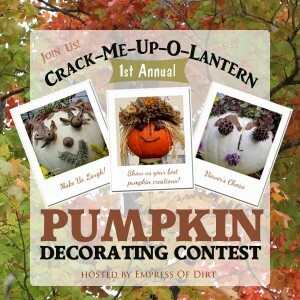 If you’d like to try your hand at decorating this year’s pumpkins with embellishments and not carving them, there’s a fun competition over on Melissa’s Empress of Dirt Blog where the winning entry could take on the illustrious title of Creator Of The Ultimate Pumpkin Head of 2014! If you prefer to carve your pumpkins, here’s an archived post on the blog that explains why we do it. Did you know the tradition originated in Ireland? 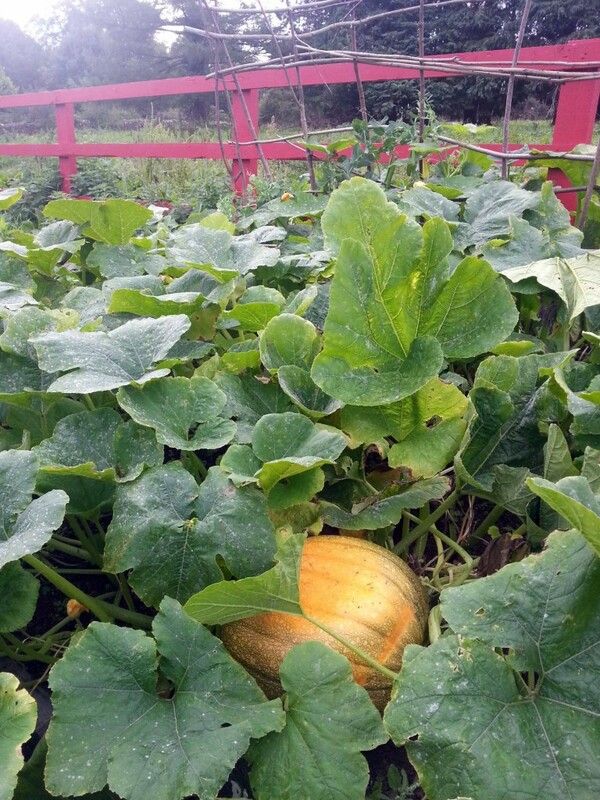 What do you think… will you be cooking your pumpkin this year? 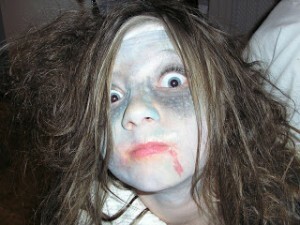 It’s that time of year when we’re all scooping out the flesh of our juicy pumpkins and wondering what to do with them. When supermarkets are selling large pumpkins so cheaply, surely we owe it to the farmers who’ve spent months growing them to at least use the flesh. Here’s are two recipes that our family enjoy taken from two favourite cook books. First up, a delicately flavoured rice from Caribbean Food Made Easy by Levi Roots. 1. Put the water, pumpkin, 2 sprigs of thyme and salt in a saucepan, cover with a lid, bring to the boil then turn down and simmer with the lid on for about 10 minutes or until soft. Remove the thyme and very roughly mash the pumpkin with a potato masher. 2. Wash the rice two or three times in a bowl to remove some of the starch, swishing it round in cold water and draining, until the water is almost clear, then add it to the pumpkin mixture. The liquid needs to cover the rice by about 2.5cm (1in). Add a little more water if necessary (or pour off some if there’s too much). Add the butter to the pan and mix until it melts. Pop the lid back onto the pan, bring the mixture to the boil then turn down to simmer on a very low heat for 20 minutes. No matter how tempted, don’t take the lid off as the heat needs to be kept in the saucepan. Don’t worry if the rice brows slightly on the base of the pan. After twenty minutes, turn off the heat and leave for a few more minutes, or until you’re ready to eat. Add the remaining spring of thyme and, if you want to serve it with lots of style, pack into a lightly oiled dish and turn it out in a neat mound on to a serving plate. Melt the butter in a saucepan then add the onion and cook gently for five minutes with the lid on. Add the potato, 700g of the pumpkin, the carrots and the vegetable stock. Cover, bring to the boil then turn down and simmer gently for about 20 mins until the vegetables are tender. Cool a little, then purée in a liquidiser. Return to a clean saucepan and stir in the milk. Meanwhile, boil some water with a little added salt and cook the remaining pumpkin for two minutes. Drain and add to the soup. Add the sugar, nutmeg and seasoning to taste. Reheat gently. 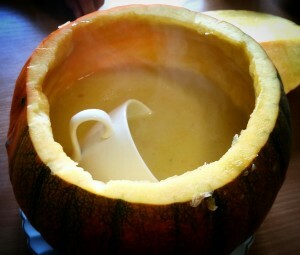 This makes a table talking centrepiece if you serve the soup in a hollowed out a pumpkin. For an added touch, line the base with some toasted baguette topped with grated Gruyère cheese before adding the soup, and popping the lid back on. Have you any favourite pumpkin recipes?